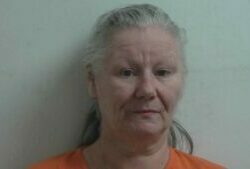 Sherry Lyn Drew, 57, is now charged with criminal threatening with a dangerous weapon. A woman was arrested following an 8-hour standoff with police in Oxford County that began Wednesday afternoon. Sherry Lyn Drew, 57, was taken into custody in Waterford and transported to Stephen’s Memorial Hospital in Norway for an evaluation. She is now being held at the Oxford County Jail on a felony charge of criminal threatening with a dangerous weapon, News Center Maine (WCSH/WLBZ) reported. Police were first called to a home on Valley Road for a domestic dispute with Drew and her husband around 4:30 p.m. Wednesday. One person inside the home was able to escape. Negotiators from the Maine State Police tactical team were brought in to try to get Drew to surrender. Police closed a section of Route 35 in Waterford during the standoff.